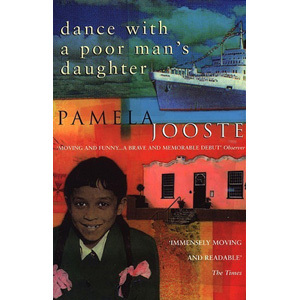 Pamela Jooste was born in Cape Town, where she still lives with her husband. She began writing for Fair Lady at the age of seventeen and had many short stories published both in South Africa and in the UK. She has written soap operas and plays for the then Springbok Radio and film scripts. Her first novel, Dance with a Poor Man’s Daughter (1998) was awarded the Commonwealth Prize for Best First Novel Africa Region, the Sanlam Prize for Fiction and the South African Bookseller’s/Book Data Choice Award.